Posted April 29, 2014 by Plum Staff. Comments and trackbacks are open. Follow the comments feed. Tagged with: Adam Hsu, Bow Sim Mark, Brendan Lai, Cheuk Fung, Cliff Lok, Doc Fai Wong, George Xu, Gong Fu, John Leong, kung fu, Kwong Wing Lam, Lai Hung, Lee Koon Hung, Marc Singer, Mok Poi-On, Ping Chow, Praying Mantis, Shek Kin, Y. C. Wong. Mr. Lai was a person of Action,Not Talk,I”ve Seen some of these Folks perform back in the 1970’s/1980’s great stuff,Golden Age of Gung-Fu. 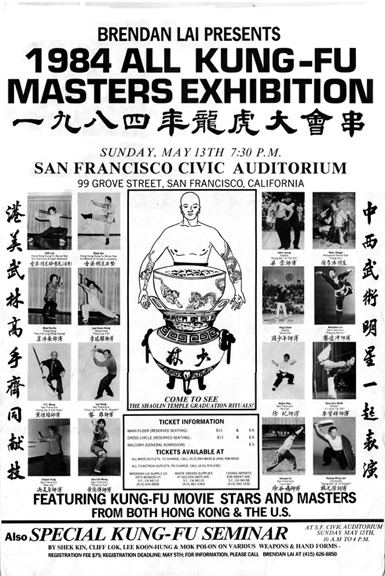 Sifu Buck Sam Kong,also promoted such Events. Best Regards.Elliott.